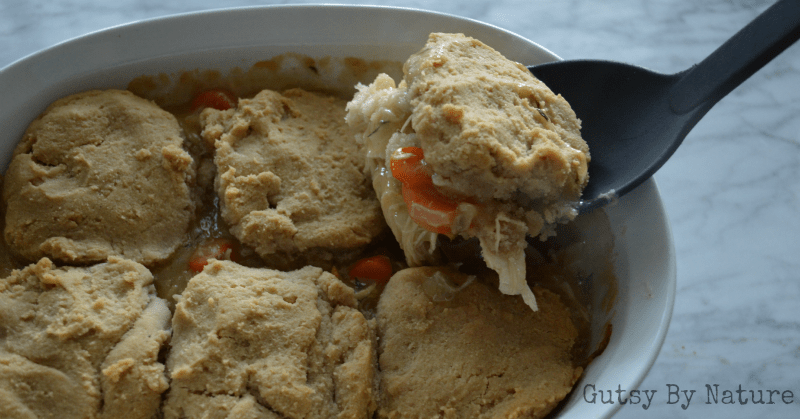 Chicken pot pie is the quintessential American comfort food, but a version that is compatible with the requirements of the autoimmune paleo protocol (AIP) but still had a creamy filling and delicate biscuit topping seemed like an impossible feat. That’s why when I had my first taste test bite of this new recipe, I did a celebratory dance not unlike the one Top Chef contestant Carla Hall did when she won the chance to make the iconic dish in a round of “cell phone shootout” on Jimmy Fallon’s show (just in case you aren’t as big a Top Chef fan as I am and don’t know what I’m talking about, here is a clip from the episode… fast forward to 3:39). It isn’t hard to find recipes for gluten-free chicken pot pie and there are even a couple frozen options available at my local supermarket. Standard “paleo” or “primal” versions using an almond flour based crust are also pretty easy to find, and quite tasty too. But what about those of us who can’t eat nuts? Coconut flour has long been an alternative to almond flour, but one that is far less than ideal because it is hard for some people to digest and generally creates a dense and dry baked good, unless you use a huge number of eggs, which are also eliminated in the first stage of AIP. What to do? Of course, I turned again to my new favorite AIP-friendly flour, cassava flour! What is cassava flour and where can I get it? Cassava is another name for yuca, which is a root vegetable grown in over 90 countries and is a staple food for half a billion people across Africa, Asia, and Latin America, though mostly unknown to most of North America and Europe. Cassava flour is simply the whole peeled root, dried and ground up. It is not the same thing as tapioca flour or starch. Tapioca flour is is the bleached and extracted starch of the cassava root; cassava flour is the whole root. Do not attempt to substitute one for the other in a recipe as they have very different actions in baking and on your digestive system. You may be able to get cassava flour locally if you live in a city with significant populations from African countries or Brazilian populations. More likely, you’ll need to order it online. Please note, the only cassava flour I can personally vouch for is from Otto’s Naturals and is what I used to develop and test this recipe. Be careful if you use other brands as I have been told that cassava flours often have a fermented sour flavor that can adversely affect the flavor of your final product. Additionally, Otto’s Naturals says that their flour has a much higher fiber content than others on the market, which can affect both glucose absorption rates and baking results. Click on the image above to learn more about cassava flour! You can buy cassava flour directly from Otto’s Naturals or from various online retailers, including Barefoot Provisions. NOTE: To make this recipe low-FODMAP, omit the onions. This AIP version of chicken pot pie is a dead ringer for the real thing, but it is completely grain, dairy, nut, and nightshade free! Heat oil in a large skillet. Cook onions, carrots, and celery until soft (about 5 minutes), stirring frequently. Add chicken. Sprinkle ¼ cup cassava flour and stir to distribute and allow it to brown slightly (about 1-2 minutes). Add broth and cook until sauce is thick and bubbling, stirring constantly. Add thyme and salt to taste. Pour into 1-2 quart baking dish and set aside. In medium bowl, whisk together cassava flour, baking soda, and salt. Using two forks or a pastry blender, mix in lard or vegetable shortening until well distributed. Add water and mix with a spoon until dough forms. Roll dough out on floured surface and cut into six round biscuits (the dough will be wet, so this may be tricky - it's OK if your biscuits look a little "rustic!"). Place biscuits on top of filling. Bake for 30-35 minutes, or until biscuits are golden brown. Did you know this recipe is very freezer-friendly? 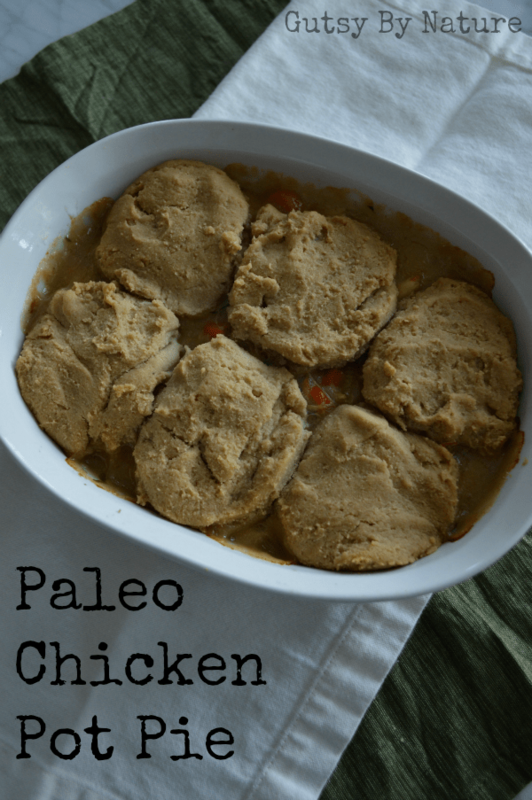 An adapted version of it appears in the community cookbook Freezer Cooking for the Paleo AIP. Learn more about that incredible resource here! Shared on Paleo AIP Recipe Roundtable. Looks like another winner Jaime! Looks amazing!!! What’s the texture like of the biscuits? Is it similar to a gluten biscuit? Any gumminess at all? Please say no! Thank you! Not gummy at all! I was amazed at how much they were just like the biscuits I remembered! I discovered your recipe last week when I was searching for an autumn “comfort meal”…all I can say is WE LOVED IT!! My husband and I enjoyed it so much that I almost didn’t have leftovers to send with him for lunch the next day! Other than the addition of pea’s because my Mom’s recipe always included them and I was missing her, the recipe was very true to form and didn’t need tailoring. I’m so happy to see that your recipe is featured in the latest Phoenix Helix Recipe Round-up. I just made this and it was great! Even my kids liked it!! It reminded me of my grandmother’s stuffing, which uses the same vegetables (I added peas). I am thinking of adding sage next time. Thanks so much for a wonderful recipe. If tapioca bothers your digestion, then you should be very cautious with cassava flour because they come from the same plant. But both tapioca starch and cassava flour are acceptable while following AIP, as long as you personally tolerate them. Interestingly, none in our family tolerate tapioca well. It leaves us with tummy aches and bloating. We can all eat Otto’s cassava flour all day long though. My gut (no pun intended :P) says that it’s b/c tapioca is highly processed with no fiber to help digestion, and Otto’s is a whole food that your body recognizes as such and knows what to do with. If you have an actual allergy to tapioca that is something different entirely. But if it’s a digestive challenge then it’s likely cassava flour would be ok. If you can have boiled yuca or yuca chips/cassava chips then it’s highly likely you can tolerate Otto’s, since it’s basically peeled, baked, and ground yuca. Nothing but water is used in the process. Hope that helps! Pot pies had become a weekly regular when I started going grain free, but then when I went AIP and took out nuts and seeds, I was deeply saddened about the prospect of not having pot pies for a while, especially in the cold north east in winter. I have tried some other recipes and it just was not the same. This recipe is amazing. The crust/biscuits are so filling I get an extra 1-2 meals out of it. And honestly I think the leftovers are even better! Even my husband enjoyed this version. Thank you for the post! Thank you for the praise! I’m so glad you like it. My husband and I love this! Do you know if the filling freezes well? Yes! It freezes very well. I frequently make a double batch and freeze the second for later. My biscuit dough was very dry. What did I do wrong? Have you (or anyone else who may read this) ever tried this with white sweet potatoes to get closer to the real thing without the in your face sweetness of an orange sweet potato? Hello, I am re sending my question, not sure it went through. Can tigernut flour be used instead of cassava flour? I just made this, adding rutabaga to the filling with some extra broth. The filling is fine, but my biscuits are hard on top and gummy underneath. They did not rise at all, or change in any way, other than turning brown. Could it be I’m doing something wrong with the cassava flour? I spooned into the measuring cup, not packing or tapping to settle, the same as I would with regular flour. Am I able to swap out the lard for olive oil instead to make this recipe? The filing was bee delicious, but my biscuits were done on top and gummy under. They didn’t rise at all. I used palm shortening, did I do something wrong? Did you use Otto’s Cassava Flour or a different brand? I have only tested this recipe with Otto’s, so I can’t say how it will work with other brands. The other suggestion I would make is to make the biscuits thinner in order to give them a better chance to bake all the way through. I realize I didn’t indicate a size for them in the recipe – I should probably amend that.